Product prices and availability are accurate as of 2019-04-09 02:50:24 EDT and are subject to change. Any price and availability information displayed on http://www.amazon.com/ at the time of purchase will apply to the purchase of this product. "QUICK R PRODUCTS" PIPE INSULATION 5/8" wall - self sealing. 3' lengths - 4-pack tan color. Copper=3/4. Ips pvc=1/2. Tubing=7/8. More thermally efficient. Cuts heat loss and stops pipe sweating. Helps stop freeze-ups. Contains flame retardants. Cut with scissors. 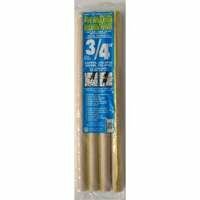 "QUICK R PRODUCTS" PIPE INSULATION 5/8" wall - self sealing. 3' lengths - 4-pack tan color. Copper=3/4. Ips pvc=1/2.